The 25th. 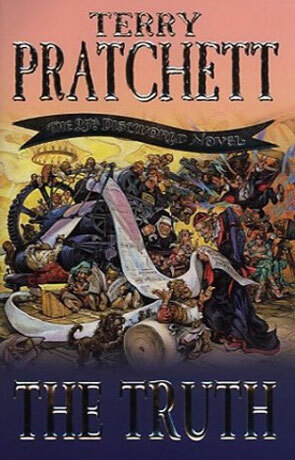 Discworld Novel the cover proudly states. And that makes it a fitting moment to take a closer look at Pratchetts Discworld and ask if there's something to be proud of. In my opinion (and I seem to be the only one writing this piece): Yes! I've read most of the Discworld novels, and while they aren't all winners, there aren't any real duds among them either. Picking up a Discworld novel you can rest assured that you will be entertainment for at least a couple of hours and that you will have at least a couple of good giggles. Pratchetts books are among the few that has made me laugh out loud. When you have read a couple of them you know what you are going to get when (or if) you pick up the next one. And therein lays both the strength and weakness of the Discworld novels. To say that, to have read one Discworld novel, is to have read them all, would be wrong, but one does seem to be a bit desensitized to Pratchetts humor after a bit. This also partially answers the question of whether Pratchett has gotten better or worse over time. Most people favor the Discworld novels they read first, and everything since then has been down hill. For better or for worse Pratchett has changed, the humor seems to be a bit more subtle, the topics a bit more relevant to the real world. Which (finally) bring me back to The Truth. When William de Worde creates the first newspaper on Discworld, he also create an opportunity for Pratchett to take the news business, as we know it, under scrutiny. As political satire it's pretty weak, but as humor it works rather well. De Worde hires a bunch of colour full people to help him, where my favorite is the reformed Vampire who is hired as photographer. Worde, gets mixed up in local police business, involving a plot against the current ruler of Ankh-Morpork, in just the way that journalists have to get mixed to in stuff like that. Soon de Worde learns something about the value of The Truth. As good as any Discworld novel. Written on 4th September 2002 by TC.